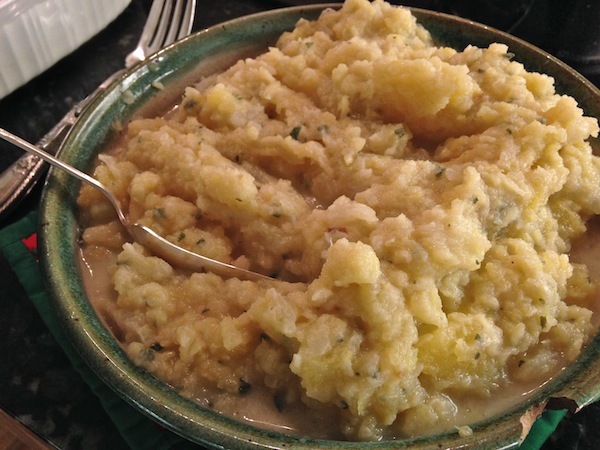 Mashed Turnip and Rutabaga with Shallot and Sage | Keep It Up, David! A rutabaga is a root vegetable that’s actually a cross between a turnip and a cabbage. 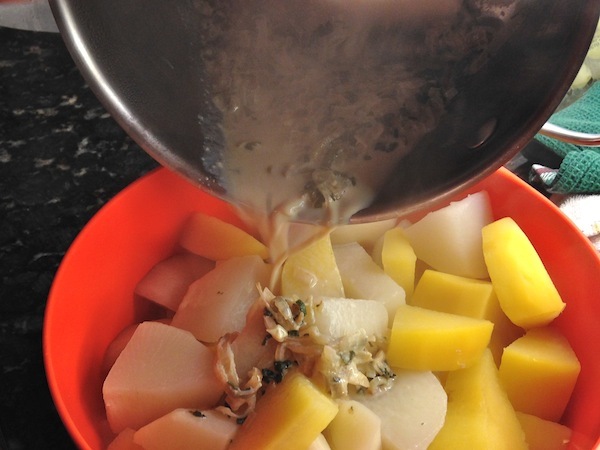 Like turnips, rutabagas are a good alternative to potatoes, with much less calories and carbohydrates. See? They’re high in fiber and vitamin C, too. I’ve never bought a rutabaga before, and it’s been a while since I’ve added anything to my Produce Aisle page, so, again, I say…why not? 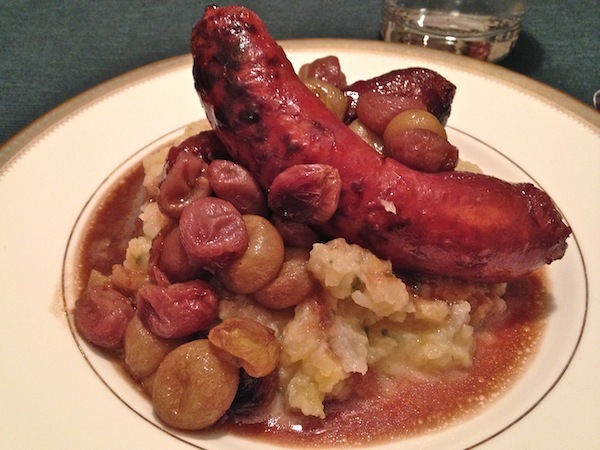 I bought two rutabagas and four turnips for this recipe, which I modified from one I found online. 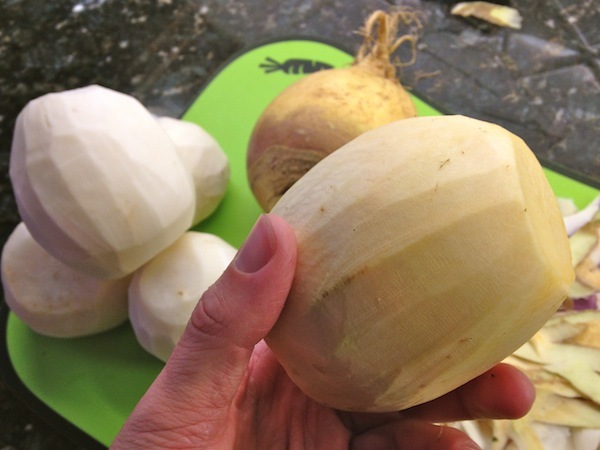 I peeled the rutabagas like I did the turnips. 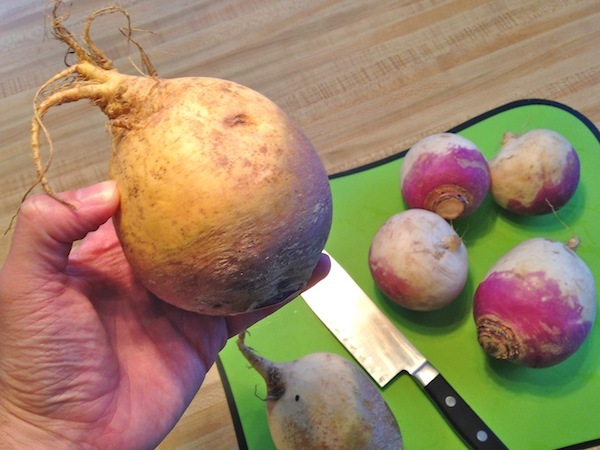 The rutabaga is a slightly different color – a pale yellow/brown. 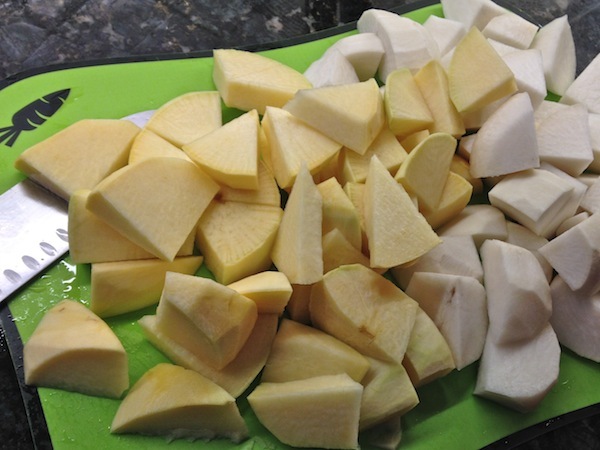 I chopped everything into similar-sized chunks, so it would all cook evenly when I boiled it. I already had a big pot of water on the stove coming to a boil. This took forever, so start it before you start peeling and chopping! I added the veggies to the boiling water, and cooked them for 25 minutes or so, until they were tender. 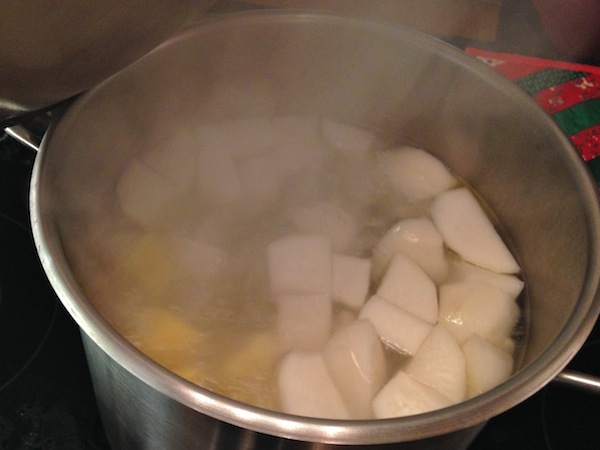 The turnips were lighter, so they bobbed along the surface, and the denser rutabagas hung out near the bottom. While they were boiling away, I made a little sauce. I melted two tablespoons of butter in a saucepan over medium heat, and added two shallots and about 20 fresh sage leaves, all thinly sliced. 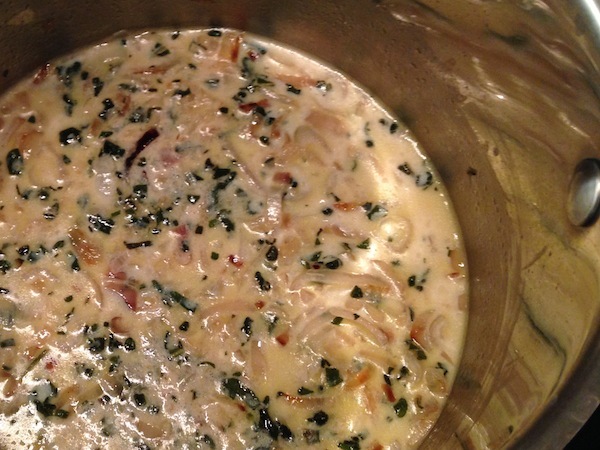 Once the shallot softened and turned a little brown, I turned down the heat to low and added a cup of skim milk, and let it simmered until the turnips and rutabagas were tender. After boiling, I drained the root veggies and dumped them in a big mixing bowl. Then I added the sauce mixture. Then, using a electric beater, I mashed it all together. I didn’t get it super smooth, so it still had some texture. Ta-da! Delicious. My parents and our guest, our friend Lynn, loved it. And there were plenty of leftovers. 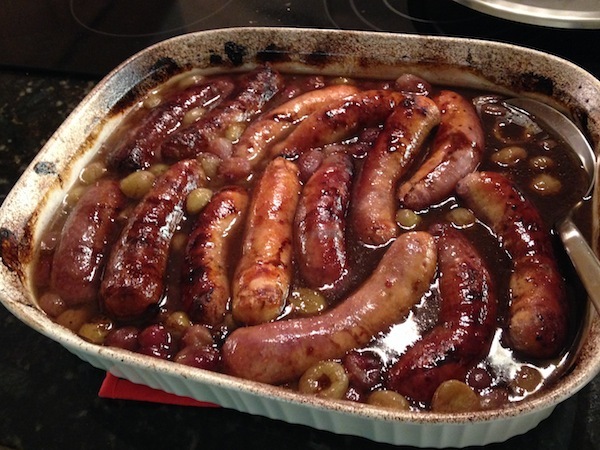 PS: Find lots of healthy recipes on my Recipes page! This entry was posted on Thursday, December 18th, 2014 at 9:29 pm and is filed under Uncategorized. You can follow any responses to this entry through the RSS 2.0 feed. You can leave a response, or trackback from your own site.